New York, NY (CHELSEA) Garvey|Simon is pleased to announce In Through the Outdoors, a 3-person exhibition featuring works by Keiji Shinohara, Alan Bray and Ray Kass. The exhibition will run from March 19 – April 25, 2015. The Opening Reception will take place on Thursday, March 19, from 6-8pm. The three artists in this show all access and convey an inward peace and meditative calm via their explorations and studies of the natural terrain that surrounds them. Keiji Shinohara and Alan Bray depict abstracted views of landscape that are both real and imagined. Their quiet narratives are contemplative and possess a surreal stillness and vacancy. Kass’s work is also influenced by hours spent outdoors. Although his work appears rooted in Modernist abstraction, his paintings on paper are derived from intimate life-studies of plants and flowers. 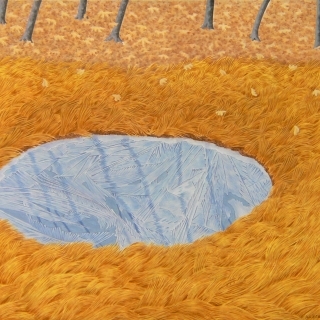 All three artists have a mystical sensibility in relation to the natural world and the placement of the three artists together (with Kass in Gallery B, and Bray / Shinohara’s work placed together in the main exhibition space) offer the viewer an open forum to interpret the introspective nuances of each. Keiji Shinohara and Alan Bray bring their artistic training and methodology from Japan and Florence, respectively, to their specific pockets of American place (Catskills and Central Maine). Each artist creates landscape that is both of place and of the mind and memory. The awe of natural phenomena is a common thread. 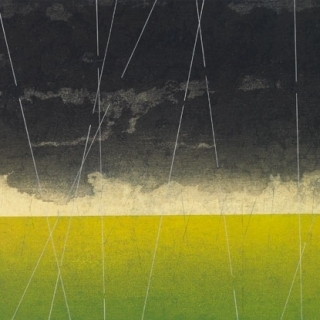 Shinohara is sparked by horizon and color – the spectacle of rain or snow or the patterns of light shimmering through foliage create areas of action and stillness in his work. Bray enjoys the curiosities found in nature, which tend to be site specific and peculiar, and most often allude to the presence of man. Ray Kass’ vibrant and mystical works on paper attempt to depict the processes of nature at work instead of a pictorial illustration. “My appreciation of the natural world is for the great variety of texture, light, form and eventful psychology that finds its maximum expression in its manifestations” says the artist. 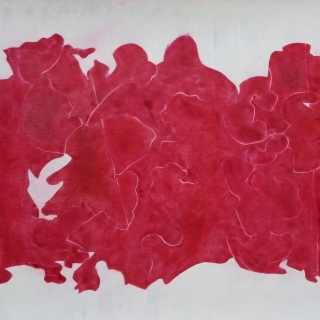 Color is key in Kass’s work and this new group of paintings is entirely in red – a surprising departure. Titled “Still Lifes” these paintings possess an amalgam of abstracted elements from nature taken directly from the artist’s garden stencils. These are abstract shapes meticulously rendered and repeated from his studies of plant material, re-constituted into a mix that is at once still life, abstraction and landscape. Garvey|Simon is a contemporary gallery with a special focus on drawing, works-on-paper, unusual materials and design. Our art advisory service, founded in 1999 by Elizabeth K. Garvey, specializes in American, Modern, and Contemporary Art.